This article is about the country music singer. For the Taylor Swift song, see Tim McGraw (song). Samuel Timothy McGraw (born May 1, 1967) is an American country singer-songwriter and actor. McGraw has released fifteen studio albums (eleven for Curb Records, three for Big Machine Records and one for Arista Nashville). 10 of those albums have reached number 1 on the Top Country Albums charts, with his 1994 breakthrough album Not a Moment Too Soon being the top country album of 1994. All of these albums have produced 65 singles, 25 of which have reached number 1 on the Hot Country Songs or Country Airplay charts. Three of these singles — "It's Your Love", "Just to See You Smile", and "Live Like You Were Dying" — were the top country songs of 1997, 1998, and 2004 according to Billboard Year-End. He has also won three Grammy Awards, 14 Academy of Country Music awards, 11 Country Music Association (CMA) awards, 10 American Music Awards, and three People's Choice Awards. His Soul2Soul II Tour is one of the highest-grossing tours in country music history, and one of the top 5 among all genres of music. Tim McGraw just recently released his latest singles “Neon Church” and “Thought About You” on October 4, 2018  He has sold more than 75 million records worldwide, making him one of the best-selling music artists of all time. Samuel Timothy McGraw was born in Start Louisiana, the only child of Elizabeth "Betty" Ann D'Agostino, a waitress from Jacksonville, Florida, and Frank Edwin "Tug" McGraw Jr., a pitcher for the minor league Jacksonville Suns and future star pitcher for the New York Mets and the Philadelphia Phillies. McGraw is of Italian and Irish descent on his mother's side, and has Scots-Irish, English, Scottish, Swiss, Dutch, Czech, and German ancestry on his father's side. In 1966, McGraw's mother lived in the same apartment building as his father, who was playing baseball for Jacksonville, while D'Agostino was a student at Terry Parker High School. When McGraw's teenage mother became pregnant, his grandparents sent D'Agostino to Louisiana to live with relatives. Through his father, McGraw has two half-brothers, Mark and Matthew, and a half-sister named Cari. Raised in the Louisiana towns of Delhi  and Richland Parish, McGraw grew up believing his stepfather, Horace Smith, was his father and until he met his biological father, McGraw's last name was Smith. At age 11, McGraw discovered his birth certificate while searching in his mother's closet to look for a picture for a school project. Following the discovery, McGraw learned from his mother who his biological father was and she took him to meet the elder McGraw for the first time. Tug McGraw denied the parentage for seven years until McGraw was 18 years old. After that time, the two formed a relationship and remained close until the former baseball star's death in 2004. McGraw's second album, entitled Not a Moment Too Soon, was much more successful than his self-titled debut, and it was the best-selling country album of 1994. Its first single, "Indian Outlaw", resulted in some considerable controversy, as critics argued that it presented Native Americans in a patronizing way. Some radio stations even chose not to play it. However, the controversy helped spur sales, and the song became McGraw's first Top 10 hit on the U.S. country charts after getting as high as number 8. The song also peaked at number 15 on the Billboard Hot 100. The album's second single, "Don't Take the Girl", became McGraw's first number one on the U.S. country charts, in addition to peaking at number 17 on the Billboard Hot 100. The song also "helped cement his image as a ruggedly good-looking guy with a sensitive side." By year's end, the third single from the album, "Down on the Farm" peaked at number 2; after that, the album's fourth single, also its title track, became the singer's second number one hit in early 1995. The fifth and final single "Refried Dreams" reached number 5. The album sold over 6 million copies, topping the Billboard 200 and Top Country Album charts. On the strength of this success, McGraw won Academy of Country Music awards for Album of the Year and Top New Male Vocalist in 1994. Billboard named Not a Moment Too Soon as the top country album of 1994 on Billboard Year-End. In 1996, McGraw headlined the most successful country tour of the year, The Spontaneous Combustion Tour, with Faith Hill as his supporting act. Hill broke off her engagement to her former producer Scott Hendricks so that she and McGraw could start dating each other; they then married on October 6, 1996. The singer's fourth album, 1997's Everywhere was released in 1997. It topped the country charts as well, and reached No. 2 on the Billboard 200, selling 4 million copies. The album spawned six singles. Four of those singles - "It's Your Love" (a duet with Faith Hill), the title track, "Where the Green Grass Grows", and "Just to See You Smile" - reached number one on the country charts. The Country Music Association awarded Everywhere its Album of the Year award for 1997. At the 40th Grammy Awards, "It's Your Love" received two Grammy Award nominations for Best Country Collaboration With Vocals and Best Country Song. Both "It's Your Love" and "Just to See You Smile" were the number one country songs of 1997 and 1998 according to Billboard Year-End charts; "Just to See You Smile" also set a record for the longest run on the country charts at the time, at 42 weeks. The album's other two singles, "One of These Days" and "For a Little While" both peaked at number 2. McGraw performing for the United States Air Force in 2003. In 2002, McGraw bucked country music traditions by recording his seventh studio album Tim McGraw and the Dancehall Doctors with his tour band The Dancehall Doctors. Unlike rock music — where it is commonplace for touring bands to provide the music on albums recorded by the artist they support, country albums are typically recorded with session musicians. McGraw chose to use his own touring band, in order to recognize their part in his success, and to capture some of the feel of a real band. Jeff McMahon – piano, organ, synthesizer, keyboards ... etc. His eighth album, 2004's Live Like You Were Dying, continued the singer's record of commercial success. The album's first single and its title track was dedicated to his father Tug McGraw, who died of a brain tumor earlier in the year, was an ode to living life fully and in the moment. The second single "Back When" was a paean to an easy nostalgia. "Live Like You Were Dying" spent seven non-consecutive weeks at No. 1 on Billboard and went on to become the top country song of 2004 on the Billboard Year-End charts. It also became one of the most awarded records by winning ACM Single and Song of the Year, CMA Single and Song of the Year, and a Grammy. "Back When" went to number one on the country charts as well. The album produced three more singles with "Drugs or Jesus", "Do You Want Fries with That", and "My Old Friend". "Drugs or Jesus" became McGraw's first single since 1993 to not ever reach within the Top 10 on the U.S. country charts, while "Do You Want Fries with That" and "My Old Friend" peaked at numbers 5 and 6, respectively. In April 2006, McGraw and Hill began their 73-concert 55-city Soul2Soul II Tour, again to strong commercial acceptance. The tour grossed roughly $89 million and sold approximately 1.1 million tickets, making it the top-grossing tour in the history of country music. It was also named "Major Tour of the Year" by the prestigious Pollstar Magazine, beating out such heavyweights as Madonna and the Rolling Stones. In a special gesture, the couple donated all of the profits from their performance in New Orleans to Hurricane Katrina relief. McGraw released his eleventh studio album, Let It Go, on March 27, 2007. The album's first single, "Last Dollar (Fly Away)", peaked at number one on the Hot Country Songs chart. This marked McGraw's first No. 1 single since "Back When" in late 2004. The album debuted at No. 1 on both the Billboard 200 and Top Country Album charts, marking his fourth No. 1 album on the 200 charts and his ninth overall. His daughters can be heard singing the chorus during the last few seconds of the song on the video. 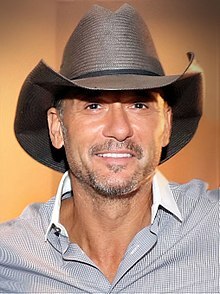 At the 2007 50th Annual Grammy Awards, McGraw received 5 nominations including Best Country Album (for Let It Go), Best Country Song (both for "If You're Reading This" and "I Need You"), Best Country Collaboration with Vocals (with "I Need You"), and Best Male Country Vocal Performance (with "If You're Reading This"). Tim McGraw with Faith Hill at the 2009 American Music Awards. On October 4, 2016, during a show at the Ryman Auditorium, McGraw and Hill announced that they would be going back on the road together again on the Soul2Soul World Tour. The tour began on April 7, 2017, in New Orleans and will continue into 2018, incorporating the C2C: Country to Country festival held in the UK and Ireland throughout March 2018. In the days immediately following Hurricane Katrina, McGraw who was raised in Mississippi, joined groups taking supplies to Gulfport, Mississippi. The two also hosted several charity concerts to benefit those who were displaced by the storm. Later in the year, the couple established the Neighbor's Keeper Foundation, which provides funding for community charities to assist with basic humanitarian services, in the event of a natural disaster, or for desperate personal circumstances. McGraw has helped out with charity events held by Minnesota Vikings quarterback Brett Favre. The Brett Favre Fourward Foundation has featured McGraw performing concerts during dinners and auctions that benefit children with disabilities in Wisconsin and Mississippi. One instance is recorded on Favre's official website. On July 12, 2007, it was made public that McGraw while in Grand Rapids, Michigan for a performance, donated $5,000 to Kailey Kozminski, 3-year-old daughter of Officer Robert Kozminski, a Grand Rapids police officer who was killed on July 8, 2007, while responding to a domestic disturbance. McGraw was married in 1996 and has three daughters. Single of the Year – "Live Like You Were Dying"
^ Franzen, Marty (June 6, 2018). "Concert Scene: McGraw and Hill bring star power to Hershey". The Intelligencer. Retrieved June 9, 2018. ^ Marra, Amber (February 5, 2011). "Country superstar McGraw learns of his Belle Grove roots". The Northern Virginia Daily. Archived from the original on May 13, 2012. Retrieved March 3, 2012. ^ a b "Tim's mom survives, has a new dream". The Florida Times-Union. Jacksonville. April 23, 2004. Archived from the original on June 17, 2013. Retrieved March 3, 2012. ^ Litsky, Frank (January 6, 2004). "Tug McGraw, 59, Is Dead; Star With Mets and Phillies". The New York Times. Retrieved June 30, 2017. ^ "Tim McGraw and Faith Hill concert to benefit Katrina relief". Country Standard Time. May 12, 2006. Archived from the original on March 12, 2007. Retrieved March 15, 2007. ^ "Tim McGraw's Special Tribute". Gactv.com. Archived from the original on 2007-06-16. Retrieved 2011-10-22. ^ "Tim McGraw's "If You're Reading This" Is In High Demand – Engine 145". Engine145.com. 2007-05-25. Archived from the original on 2014-12-18. Retrieved 2011-10-22. ^ "Nomination's For 50th Annual Grammy Awards". eonline.com. 2007-12-06. Retrieved 2012-11-01. ^ News, A. B. C. (22 September 2016). "30 Country Music Stars Join Forces for Historic CMA Music Video". ABC News. Retrieved 9 January 2018. ^ "Tim McGraw & Faith Hill Sign With Sony Music Entertainment: Exclusive". Billboard.com. Retrieved 9 January 2018. ^ McGraw, Tim. "Excited to announce our new album and new single, The Rest Of Our Life. Thanx for being a part of our journey!". Twitter.com. Retrieved 9 January 2018. ^ "Country Strong Hits Hollywood". Us99country.radio.com. Archived from the original on 2012-07-19. Retrieved 2011-10-22. ^ a b "Tim McGraw likes the sound of Gov. McGraw". Associated Press. 13 January 2006. Archived from the original on 16 January 2006. Retrieved 23 May 2017. Country singer Tim McGraw says he wants to run for office someday in his adopted home state of Tennessee — perhaps for governor or U.S. senator — and he’s getting encouragement from a fellow Democrat, former President Clinton. ^ "Gov Tim McGraw?". antiMusic. 3 January 2008. Archived from the original on 18 July 2012. Retrieved 23 May 2017. Country star Tim McGraw is considering following in the footsteps of actor Arnold Schwarzenegger by running for governor in his native Tennessee. The Democrat is weighing up plans to succeed Democrat Governor Phil Bredesen when his second term finishes in 2010. And his wife Faith Hill is thrilled by the idea of becoming a first lady. ^ Eileen Finan (10 September 2008). "Tim McGraw: The Two Sides of Tim". People. Archived from the original on 19 December 2008. Retrieved 23 May 2017. It's innate in me to be a blue-dog Democrat. I'm not saying I'm right or wrong, but that's what I am. My wife and I and our family will do everything we can to support Obama. I like his ideas, I like his energy, and I like the statement he would make for our country to the world. ^ "Tim McGraw". Biography.com. Retrieved 21 February 2019. ^ Paxman, Bob (2013-01-28). "Tim McGraw Talks to "Town Hall" Fans". Country Weekly. Retrieved 2015-02-23.